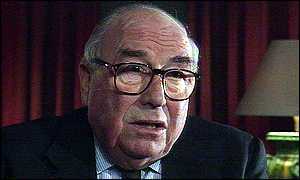 Roy Jenkins was a civilised, liberal, decent politician, for those who liked him. For harsher critics he was a snob who had betrayed his party and his working-class roots. He had set out to be prime minister but his focus was never on politics alone. He was a rare creature among modern politicians: a man whose other interests, as a prolific and noted author and journalist, more than made up for any disappointments. Lord Jenkins was in fact a product of the mining valleys of south-east Wales, his father a miners' agent who became a Labour MP. He was immersed in Labour politics from an early age. From the local grammar school, he went on to take a First at Balliol College, Oxford before entering Parliament just after the Second World War. His wartime experience as a captain in the Royal Artillery and as a codebreaker, helping to crack the secrets of the Enigma machine at Bletchley Park, moulded him into one of the first true believers in a united Europe. Although he initially flirted with the left-wing of the Labour Party, Lord Jenkins became a committed supporter of the party's charismatic, right-wing leader, Hugh Gaitskell, though he was dismayed by Gaitskell's abandonment of the European ideal. When Gaitskell's arch-rival, Harold Wilson, took office in 1964, Lord Jenkins was rapidly promoted. From being in charge of aviation, a potential political hot potato, he made a name for himself as a radical home secretary. Abortion and homosexuality were legalised, divorce was made easier, and theatre censorship was abolished. He saw himself as a libertarian, a defender of individual rights against the state but, for decades to come, he would be blamed by right-wingers for society's many problems. He became Chancellor of the Exchequer following the devaluation of sterling and James Callaghan's resignation in 1967. He was an austere, some would say over-prudent, Chancellor who tried to turn around Britain's sickly economy and refused to make big tax cuts. The left accused Jenkins of losing the 1970 general election by introducing a dull, low-key budget. He countered this criticism by reaffirming his belief that "the public are highly sceptical of give-away budgets immediately before a general election". In opposition, Jenkins waited for the big moment, the chance to replace Wilson. But his high hopes were wrecked by the great debate of the day, whether Britain should join the European Community. Labour was bitterly divided and Jenkins resigned as Deputy Leader when the party eventually turned against Europe. In 1975, he led the successful referendum campaign to keep Britain in Europe. Roy Jenkins was a natural choice to be the first British President of the European Commission, where his term was primarily remembered for reviving the idea of European monetary union. But his sights were still on domestic politics and, while Labour took big strides to the left, Jenkins and a few friends, including former Cabinet ministers David Owen, Bill Rodgers and Shirley Williams saw the chance to step into the centre ground. It was the start of a big adventure, during which the Social Democratic Party and the Gang of Four would climb to over 50 percent in the polls and Jenkins would win a by-election in Glasgow. But Jenkins and David Owen soon fell out over the party's partnership with the Liberals and the SDP folded within a decade. In later years, Lord Jenkins would have been very much at home in New Labour. His books, mainly political biographies, were popular and critical successes and his biography of Gladstone brought him a coveted Whitbread Prize, beating Salman Rushdie in the process. Lord Jenkins enjoyed the high life: a devotee of fine wines and food, Harold Wilson once described him as "more of a socialite than a socialist." He kept a good table, where politicians, academics and other members of the glitterati were constantly entertained by discussion and anecdote. The liberality of Lord Jenkins' politics was mirrored in his private life. Numerous love affairs, most notably with Jackie Kennedy's sister Lee Radziwill, were conducted discreetly and failed to damage a long and loving marriage to his wife, Jennifer. He was particularly proud of his election as Chancellor of the University of Oxford, where he beat his old Balliol colleague Sir Edward Heath, and modest about his distinguished output as a political biographer. Roy Jenkins was a private man, his manner, which his friends said was a product of his overwhelming shyness, was frequently off-putting. But he changed the shape of British society, and changed the shape of British politics, too.